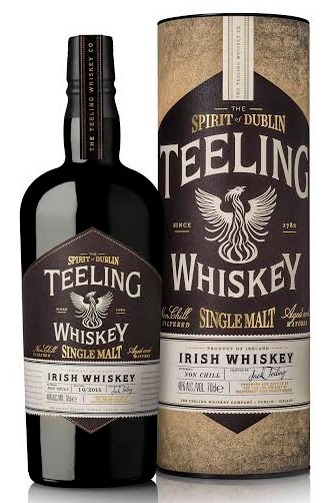 Teeling Single Malt consists of aged Malt whiskey up to 23 years (the whisky is a NAS) old that has been matured in five different wine casks including Sherry, Port, Madeira, White Burgundy and Cabernet Sauvignon. This combination of cask maturation techniques is quite unique to Irish whiskey and like all the Teeling whiskeys, it is bottled at 46% with no chill filtration allowing for all the natural flavours of the whiskey to be retained. Nose: Nice and rich with banana bread, cereals and sweet malty notes up front, some sweet pasty (doughnuts if you wish, it’s Hanukka after all). on the second wave of aromas I am getting some more fruit : apple peel and stewed pears, as well as ripe melon. Quite the sweet malty and delicious nose. Palate: Boom. what a rich palate, quite spicy too with peppers, a lot of that melon and mango notes here, much more pronounced than the nose, exotic fruit salad here we go! it’s also creamy with fresh vanilla pods, but the pepper does stay in the background and does a comeback towards the finish, with a gingery sharp note too. Finish: peppery, gingery and spicy, with the melon hanging in there as well as cereals, and the Madeira playing first violin. A really tasty dram. really good stuff. sweet, fruity, accessible and fun to drink. A very good whiskey from Teeling. Cant wait for them to start distilling themselves!